capable of acquiring and mapping multi-channel laser profilometry data, as well as LaserVideo™ imaging (LVI), laser-scanned FPI and straightness data. As show below, the LVIprovides an image of the component surface similar to that of a borescope. The LVI, however, is unaffected by the optical distortion that is typical for borescopes. It is a quantitative map of the surface reflectance that allows operators to locate and measure features such as chips, scratches and discoloration. A powerful aspect of the LaserViewer™ software package is its ability to be configured for customer-specific applications. In this manner, only functions and views that are specifically required for a given task are displayed to the operator. The graphic user interface can be configured for simplicity of operation and application-specific functionality. 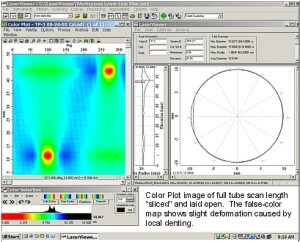 In addition, a variety of custom data analysis modules are available with the LaserViewer™ software program. Dual image comparison - allowing operators to superimpose two data sets for evaluation and quantitative feature comparison.